HURRY! FREE TICKETS TO TITANIC 3D (Canada & USA) Some cities are all out. 2 tickets per person allowed. Valentine's Day, February 14th! ~OVER~3 PAIRS OF TICKETS STILL AVAILABLE IN VICTORIA, CALGARY & EDMONTON! 3 pairs have been won by SnyMed Blog Winners! Win 2 movie tickets to see The Woman in Black from the SnyMed: Living High on the Hog, Without Paying for the Hog blog today (Victoria, Calgary & Edmonton)! I have 4 tickets per city, 1 pair per winner. All screenings are for tomorrow, Wed Feb 1st @ 7pm at the below locations (by city). 4 Ways to Win! 4 ways to enter. For each entry, leave a note below in the comment section to say you have completed each task. (You can complete 1, 2, 3 or all the tasks, your choice!) Please state which city you would like to win tickets for. Follow this SnyMed blog via Google + at the top right corner of the screen (2 entries). Follow @SnyMed via Twitter (2 entries). Tweet about the giveaway on Twitter, with link back in the comments section (1 entry). Share this contest on Facebook, with link back to comments section (1 entry). Winners will be contacted today (Jan 31st 2012), so check back to see if you are a winner. Passes will be e-mailed to winners either late Jan 31st or early Feb 1st. Hurry! FREE Philly Cooking cream coupon is now live on the Real Women of Philadelphia website. Yes, open to Canadians! How to Find Contests for Canadians! What a great feeling to get an e-mail, phonecall or letter declaring you the winner of a new iPad2 or of $1000! Sound far-fetched? I won both an iPad2 and $1000 cash in 2011 from contests! You don't have to be lucky to win contests, just know where to find them! The one biggest challenge is to first find contests that are open to Canadians. 1. Start with Canadian websites dedicated to aggregating contests open to Canada. Saveland is a great place to start, as their community posts contests open to Canadians. They also have their own contests running all the time for blu-rays/dvds, vacations and more. Cool Canucks is also another such site. 2. Facebook and Twitter also have contests running regularly on Canadian fan pages. Contests currently running (as of press time) include: Oral B Canada and Tim Hortons (Facebook). Alliance Films regularly has contests for free movie screenings and tickets (Twitter). These are just a few examples of Facebook and Twitter contests. Think of any large Canadian company, check their Facebook or Twitter page, and after a few tries you are bound to find a contest. 3. Check instore displays for contests, look at cereal boxes, printed company flyers, online newsletters to which you subscribe, newspapers, magazines, company websites of brands that you enjoy and on your favourite blogs. Contests are everywhere! Here are a just few companies that regularly feature contests for Canadians, to get you started: Family.ca, Flare.com, CBC.ca and Breakfast Television. Good luck, wishing you many great wins! 3 Ways to Live Cheaper in Canada! There comes a time in many of our lives, that money is extremely tight or non-existent. A loss of a job can create this situation, reduced pay due to maternity (paternity) leave, or extended leave from work due to illness. Whatever the reason, times like these call for resourcefulness to receive items for free or at a serious discount. 1. Freecycle is a great place to receive items such as furniture, building materials, clothing, strollers, baby accessories and other items absolutely for FREE. I once saw a FREE working car given away on Freecycle! There are chapters of Freecycle WORLDWIDE and it is free to join. Freecycle is a great system, whereby you give/receive items for free to your local community. Items get reused and recycled--without going into a landfill. 2. Free books - There are many ways to receive free books, besides the public library. iTunes Canada regularly offers free e-books for iPhone and iPad users, as well as Amazon.ca for eBooks, like Kindle. Just type "free e-books" on google, and watch hundreds of choices pop up! For paper books, BookMooch is the way to go! It's a free service available to Canada, USA and worldwide. Simply, select books that you would like to receive --and they are sent to you for free (no shipping). Similarly, when someone wants a book that you are offering, you give it away for free (you pay shipping this time). If your shipping budget is slim or non-existent, list thin books or kid's books that cost only 1 or 2 postage stamps to ship! 3. Stretching the Dollar - Kijiji and Craigslist are great ways to pinch your pennies. From cars, to furniture, to musical instruments, to appliances and more, both services allow you to list ads for free. Just do a bit of comparative shopping, and you are sure to find what you are looking for at usually 50% off of retail--or more. And both sites have "free" sections, where you can shop items being offered at no cost. ~WINNERS~ SnyMed So Many Valentines Greeting Card Giveaway! Win Valentine's Day Greeting Cards! WINNERS: Evan, Teddy Out Ready, Brenda, Andrea Winners, check your e-mails! Yes, it is the first ever SnyMed "So Many Valentines Greeting Card Giveaway!" 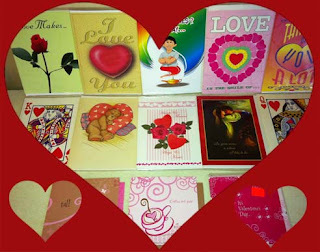 4 winners will receive 10 full-sized greeting card Valentines that come shrink-wrapped with envelopes, from the assortment shown above. How to enter? Scroll waaay down to the bottom of the page, and you will see the Rafflecopter entry form. So far, there are 0 entries, so your chances are great! Details: Runs until Sat Feb 4th 2012 at 11:59pm. The winners will be contacted on Sun Feb 5th and the "loot" will be sent out on Monday. Open to Canadian & US this time (due to the need for the prize to arrive before Valentine's Day). Due to mail service, SnyMed cannot guarantee timely delivery to the US before Valentine's Day. Getting Free Stuff on Facebook! The truth about getting free stuff in Canada, is that most freebies start on Facebook fan pages. What do Cadbury Dairy Milk, Triscuit Canada, Maple Leaf Foods and L'Occitane en Provence all have in common? The answer is that these are just a handful of companies who recently gave away free products to Canadians that originated from Facebook! What does this mean to the average Canadian--and how do you get free chocolate bars, boxes of crackers, packages of bacon and vials of designer hand lotion? First, you need to have a Facebook account in order to qualify for many of these freebies. Next, you need to find out which companies are offering free product coupons and samples--and when. Checking out a good site like Zwap (in the freebies section) will definitely tip you off to Facebook offers. Other sites like Smart Canucks and Red Flag Deals also have forums for free stuff. Sometimes knowing when and where a freebie is being offered is not sufficient to pluck what is free. When quantities are limited (which is always the case), time is of the essence to hurry to get a freebie for yourself! Wishing all of us many more great freebies for 2012! “You must have always known you wanted to have a big family!” Whenever I go out with my children, this is a statement I often hear. The answer does seem to be self-evident. Otherwise, why would someone choose to have 5 children in just 5 years? I will tell you my answer. It was 15 years ago when my boyfriend (now husband) and I had “the” discussion? You know, the one where each states that they had always wanted to have 2 boys, or a singleton, or a group of 3 giggling girls. That discussion. My husband–an only child—went first. He stated that he would like to have 2 children one day. I was mortified. What I was going to say would surely break us apart and end our relationship. Can you guess what I was going to tell him? I bet you cannot! I went on to tell my boyfriend that I planned on remaining childless, and if he wished to have any children, that he should find another woman – as that woman would never be me! At first my boyfriend was speechless. His expression was one of surprise, but then he became thoughtful and tried to compromise. He then told me that he would also be happy having only one child. As an only child himself, he had wished to have a sibling, but he could be satisfied with only one. He nodded at me, hoping I would agree. I did not agree and had the unpleasant task of telling my boyfriend that I did not want any children, not even one. There was a long silence on his part. But love was young and we stayed together, him agreeing that he would find peace with having no kids whatsoever. Many years passed. Our careers were successful. We bought a house. We bought a large Newfoundland Dog. Many more years passed. We got engaged, then married. I was considering buying a second dog. Then one day at work I received a simple e-mail from my husband. It had a photo of twin infants. The message read: “Which one do you like better?” 3 years passed and I received half a dozen similar messages. My husband never pushed, but always coaxed me gently in the direction of having “just one” child. So, not having changed my mind, I agreed to have “just one” child. I still did not want to have any children, but did not wish to deny my husband of having the child he so yearned for. I wanted to make him happy and decided to make a leap of faith. I was pregnant within 3 months. As I was labouring the birth of our first child, I thought I had made a terrible mistake. I still did not want to have a child—why had I agreed? My son arrived without my agreement. The whole family thought he was cute and were thrilled for his arrival. I am not sure exactly when it happened, but I started loving having our son too. I loved having a child so much, that 5 months later I was pregnant with our only daughter. I told my husband that I even wanted to have a third child, and with surprise he agreed. 20 months after our daughter’s birth, our second son was born. I had to really convince my husband to have a fourth child – he thought I was crazy, but finally agreed. Our third son arrived exactly 12 months later. However, my husband absolutely refused to have a fifth child. How could the one who pursued me for so long to have a child, deny me of having another? It was a very difficult time in our relationship, as I felt like someone in our family was missing. Finally, my husband agreed to have a fifth child. However, he made me agree that if we were to have a fifth child, that there would never be a sixth one. He just wanted each child to have individual attention, and felt like he was being spread too thin. I readily agreed and our fourth son was born 15 months later. So, that is our story of how we went from 0 to 5 kids in five years. It really was about taking that first leap of faith, in order to open my heart to having children. I'm the Guest Writer for Larger Family Today! 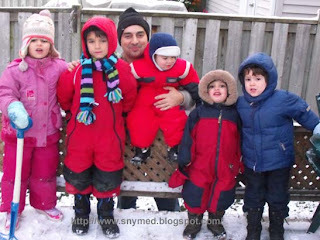 Today I'm the guest writer for Larger Family Life, here: http://networkedblogs.com/tdODa I wrote an article of how we went from 0-5 kids in 5 years...and why. I will publish my column on the SnyMed blog today, for those interested.